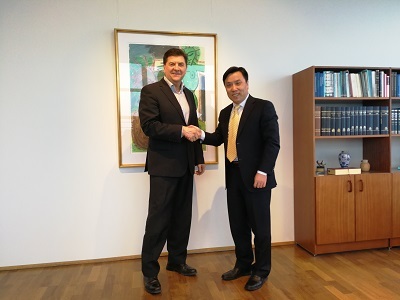 On March 14th, Chinese Ambassador to Iceland Jin Zhijian met with Haraldur Johannessen, National Commissioner of the Iceland Police. They exchanged views on how to strengthen cooperation between the two sides. Jin expressed his gratitude to the Icelandic Police for its long term great support to the Embassy, and stressed that with the closer friendly exchanges between China and Iceland, and increasing people to people communications between each other, the significance of bilateral cooperation between the police forces has been increased. Providing security for the Chinese citizens in Iceland is one of the major responsibilities of the Embassy, an effective mechanism is advised to be established in order to ensure the development of Sino-Iceland relationship . Johannessen thanked Jin for his visit. He recalled happily the nice experience during his participation in a meeting in China years ago, expressing his willingness to keep close communication with China's counterpart and the Embassy, so as to work together to provide the relative service and security.